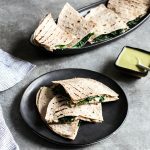 The thing to do would probably have been to post these quesadillas before Labor Day, so that anyone who planned to be grilling could make them. Instead, I’m behind the curve, posting just as everyone who traveled this weekend or took the day off is settling back into the swing of things. 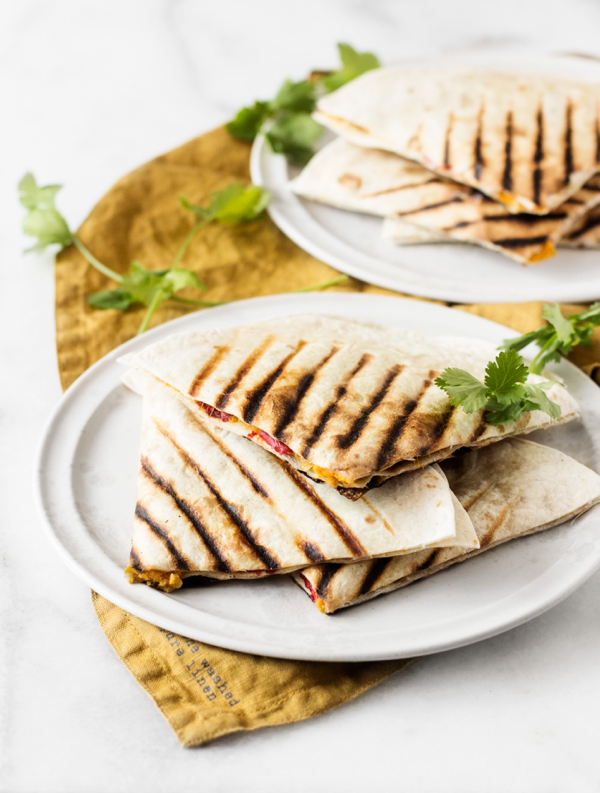 The good news is that the quesadillas demand neither a grill (I made them with my grill pan–a little aggressively, as you can see by the deep grill marks–and you can also just heat them up in a skillet) nor a holiday weekend. They’ll be delicious whenever you choose to make them, and I hope that time will be soon. 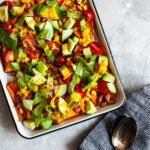 They recipe is relatively simple, but the sweetness of roasted bell pepper and sweet potato, coupled with some garlic and lime and cumin, is really irresistible. You can serve them at breakfast, lunch, or dinner, and you can pair them with all sorts of other dishes, from tortilla soup (which is how I served them last night) to salad to an array of veggie sides. In the recipe, I give the option either to roast your own bell peppers or to use store-bought roasted peppers. I almost always have a jar or two of these at home, as they make a tasty addition to hummus, dressings, or my beloved sunflower seed romesco. That said, roasting the peppers yourself will produce a more authentic smoky and sweet flavor, and it’s really easy to do, so if you have the time, it’s worth it. If not, employ the shortcut and turn this into an easy pantry meal! It’s worth saying that the mashed sweet potato and white bean filling is good. Really good. Good enough to eat on its own, with corn chips or veggies or a spoon. It’s the kind of concoction that makes me appreciate what can be done with plants to put a creative spin on a traditional recipe. 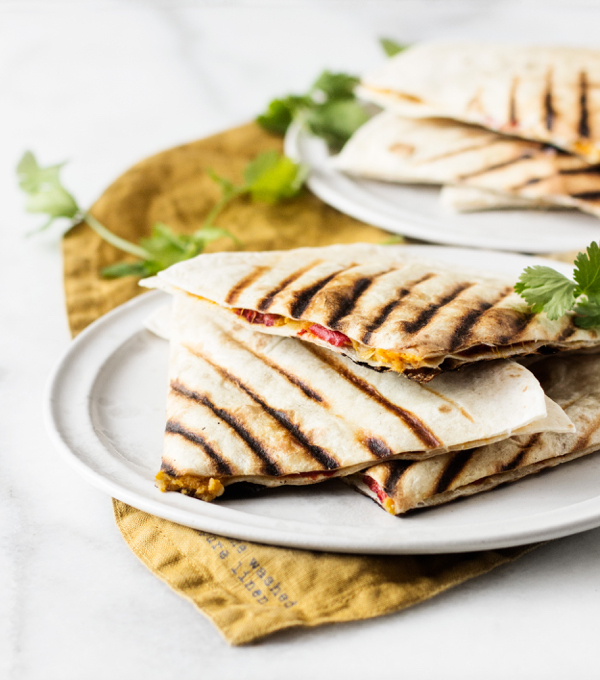 Clearly, there’s no cheese in these quesadillas, so the recipe title takes some license. 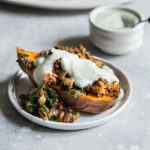 But the combination of cannellini beans and sweet potato creates its own sort of creaminess, and I think you’ll find that it’s very satisfying in the place where cheese would normally be. If you're roasting peppers, preheat the oven to 425F. Place the peppers on a lined baking sheet and bake for 30 minutes, or until the skins are blackened and the peppers are collapsing. Remove them from heat and allow them to cool until you can handle them. Remove the seeds and the burnt skin. Transfer the soft, roasted pepper pieces to a bowl and set them aside. Decrease oven heat to 375. Cut the potatoes in half and scoop out the flesh into a mixing bowl. Add the white beans, garlic, cumin, chili powder, paprika, lime juice, salt, and pepper. Mash the mixture with a potato masher, until it's mostly mashed up but some of the whole beans are still visible and the potato is still a little chunky. Check seasoning and season to taste. To make the quesadillas, divide the filling between 4 tortillas. Add a few strips of roasted pepper to each and cover with another tortilla. 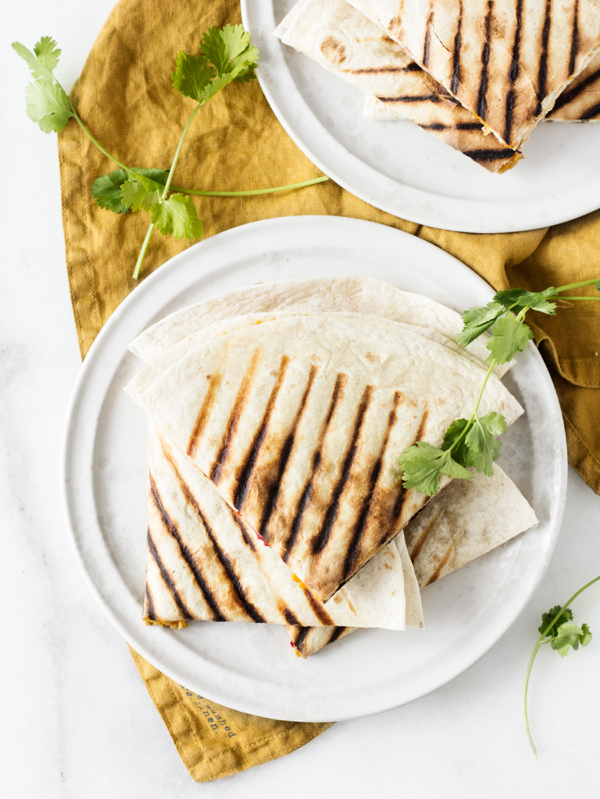 Transfer the quesadilla to a lightly oiled grill pan or skillet, and heat until the bottom side is lightly browning (or forming grill marks). Flip and repeat on the other side. Cut each quesadilla into quarters, and serve. Leftover filling will keep for up to four days in an airtight container in the fridge. You can also make these with white potato, if you’re in the mood or that’s what you’ve got on hand. Yukon gold potatoes would work very well, and make a less sweet recipe. But I personally love using sweet potato here…and, well, everywhere. I hope you’ll give these a try, and that you’ll love ’em. On that note, I’m winding down for the night. But first, an update: thanks for your feedback on hearing more about my batch cooking/weekly meal planning! I’m glad that this idea appeals to you. I’m going to start sharing next week, and you guys can tell me what additional info/details you’d find helpful. I love making quesadillas but never have tried my hand at red pepper ones before. 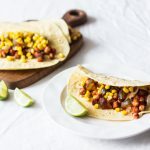 These look delicious and I love that they are vegetarian too. Mmmm….I must try this. Sweet potato makes for the best quesadilla!! Gena, this looks absolutely amazing! I just printed out the recipe so I can make it this weekend! I made this for dinner tonight – it turned out great! I cooked it on a panini press. Next time I think I might add some caramelized onions or, flipping it the other way, some sriracha. (I am not a vegan, nor a raw food..ist? foodie? um, raw food eater! but I absolutely love food of all types and this went over well with the entire family!) Thanks for the great recipe! Hooray! So glad you liked it, Violet. I’m hardly a raw foodie these days, either, but I love when non-vegans enjoy vegan recipes, and it’s great to hear that the recipe turned out nicely for you. Caramelized onions would be a terrific addition. Finally got around to trying this and I gotta say- LOVED IT! Thanks for posting this great recipe!